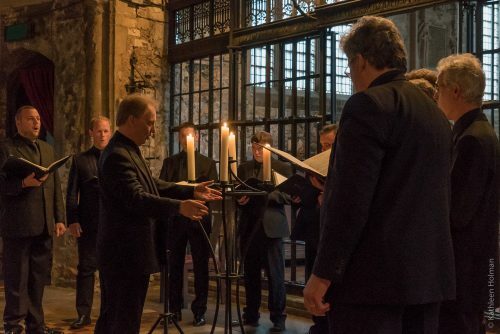 Most Christian liturgies are strongly associated with singing, but none are defined by the intoned human voice quite like those of the Eastern Orthodox Churches. The ‘spoken’ word is entirely absent from the Russian liturgy, lacking as it does the element of spiritual theatre endowed by the solemn chants of the Znamenny, Kievan and oth-er chant traditions. No surprise then, that there should be a wealth of choral music associated with this liturgy, dating back to the 16th Century and evolving more-or-less uninterrupted until the sudden decline in the Church’s fortunes which accompanied the Bolshevik Rebellion in 1917. Russian choral music has been a feature in Tenebrae’s concert performances since the choir’s inception, and this exquisite collection includes some little-known gems, rarely heard outside Russia, as well as some familiar favourites from this vast area of choral repertoire.